A Gladstone Region based team have been announced as not only joint Queensland State winners but also the National Winner of the Tech Girls Movement’s 2018 Search for the Next Tech Girl Superhero Competition. Girls aged from 7-17 years old in Australia and New Zealand are encouraged to form a team and enter the competition. They are then matched with a female tech mentor who meets weekly with them for 12 weeks. Teams identify a problem in their local community to solve, then research and document a solution in a business plan, build a working app prototype and pitch it in a public. 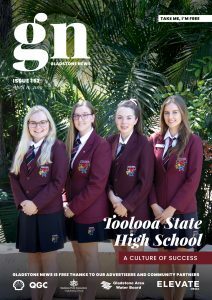 The Domestic Angels team, comprising of four girls from Gladstone State High and one from Boyne Island State School received praise for the development of their app tackling the problem of Domestic Violence. 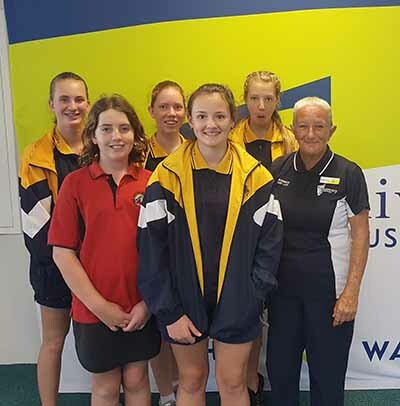 The local girls, Sarah Windsor, Jasmine Gibson, Michaela Green, Georgia Green and Kasey Pfeiffer were mentored by Dr Jan Lewis from CQ University. The Domestic Angels app developed by the girls was made to allow victims of domestic and family violence (DFV) to contact Police without being detected by their abuser. This app has been disguised as a cleaning app to avoid detection by the abuser and to stop inadvertent use or abuse of the app. The app allows the victim to contact Police using three quiet, simple and fast steps while keeping the abuser completely oblivious to what the victim is doing and thus keeping the victim safe. The girls said they have been in talks with Gladstone’s local Domestic and Family Violence Prevention Officers to see how they can go about developing their app further. The girls and Dr Lewis will travel to Silicon Valley in the US in August next year for the global finals. The National Winners Prize is proudly sponsored by Stockland. The competition saw entries from more than 1,000 girls across Australia and New Zealand. Research shows that girls opt out of technology from the age of 6, impacting future skills and lowering awareness of information technology careers for girls. Stockland Gladstone Centre Manager, Diana Mitchell said the company was very proud of the local team. “We are proud to support the Tech Girls Movement inspiring schoolgirls to consider the opportunities for study and careers in technology,” Diana said. “As a champion of gender equality and diversity in the workplace, Stockland actively supports initiatives that help open pathways for girls to exciting and rewarding careers,” she added. The winning team were presented with their $1000 prize money at the Gladstone State High School Awards Night.